If a socially prominent gorilla is in the midst of a meal, it may hum or sing to tell others nearby that it's busy at the moment and will get back to you later. This is a short edition of Science Talk, the podcast of Scientific American, for February 29, 2016. I’m Steve Mirsky. Dolby Sound in a theater showing Jurassic World? The engine of Fat Boy Harley-Davidson? What is really is is a gorilla. A male gorilla humming in the middle of a meal. Eva Luef, with the Max Planck Institute in Germany. “But no systematic studies were ever conducted on the humming and singing, before ours. So our study is the first one that looked at which calls are used during which feeding instances in gorillas. So we recorded all foods that were eaten by the gorillas and all sounds that it produced during eating those foods. And we found that it was males, so blackbacked and silverback males were the most frequent callers. “We believe that the food calls have a social function in gorillas. That they may signal to listeners that an individual is busy eating at the moment. 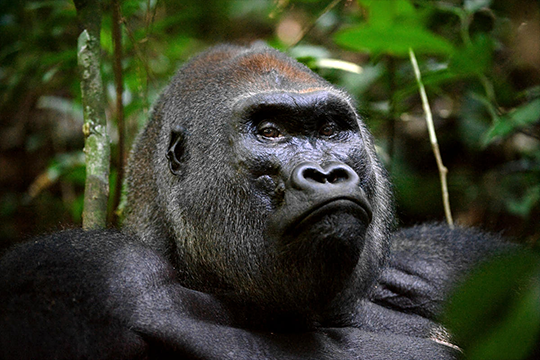 Silverback males have a special role in gorilla society, and they’re the leaders of the harem group. And they are most often the ones making group decisions, so when the silverback sits and eats the others eat as well, and he gets up and starts to move and travel in the forest, and the others follow him. “So it makes sense for the silverback to signal to his group mates that he’s still eating and then signal that he has finished eating when he stops calling. A similar function has been ascribed to chimpanzee food calls. So they have a social function as well. “We think that great ape food calls are important to study as they can tell us about the evolutionary history of human vocal abilities. Gorillas, like any great ape, they’re closely related to humans. And what they can do with their vocal apparatus and how they use their vocalizations can tell us a lot about how this may have evolved in early humans.